These professional presentation folders will give you a polished finish to your presentation. Printed in one to full colour, on a high quality board. Internal pocket plus card slots for either portrait or landscape business cards make these a versatile, cost effective solution. STOCK: 260 gsm quality hi-bulk art board. Printed full colour on outside, pocket is blank. Your choice of landscape or portrait card slots. STOCK: 240-270 gsm quality board. Printed full colour on outside and pocket. Supplied flat – ready to snap assemble. Your choice of landscape or portrait card slots. Printed 1 colour on outside and pocket. Supplied flat – ready to assemble. 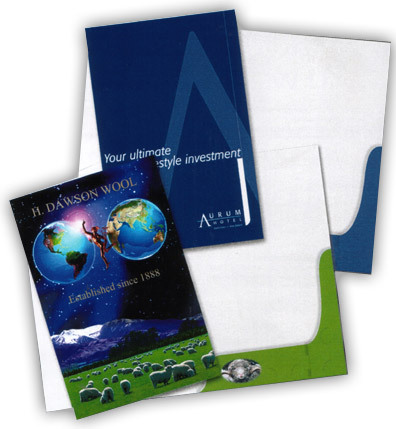 Double pocket folders also available – contact us.